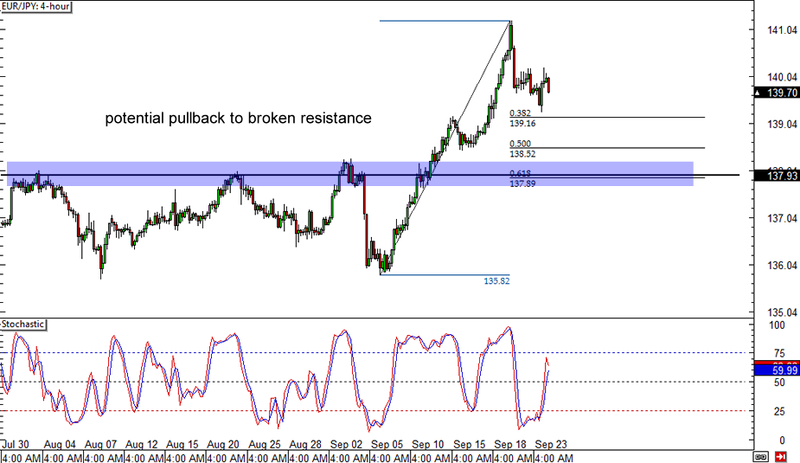 Is EUR/JPY ready to take a break from its recent climb? If so, the pair could retreat to the Fibonacci retracement levels marked on its 4-hour forex chart, as these line up with potential support zones. The 50% Fib coincides with the 138.50 minor psychological level, which appears to have acted as an area of interest a few days back. Meanwhile, the 61.8% Fibonacci retracement level lines up with a broken resistance area and the 138.00 major psychological mark, which could also hold as a floor. Stochastic is already climbing higher though, indicating that euro bulls could push the pair right back up to its previous highs. Here’s another break-and-retest situation that’s already starting to play out. AUD/JPY appears to be making another attempt at pulling back to the broken long-term resistance at the 96.00 major psychological mark. This is right in between the 50% and 61.8% Fibonacci retracement levels, which could hold as additional support zones for the correction. Stochastic is already indicating oversold conditions, which means that sellers are exhausted and that buyers could take over soon. 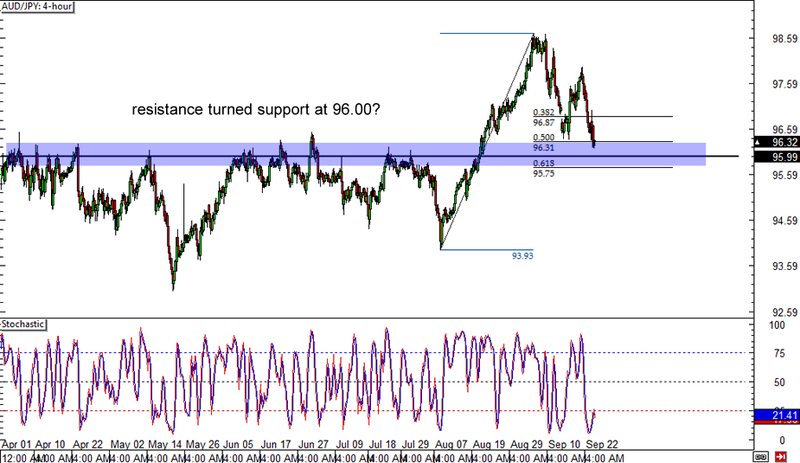 In this case, AUD/JPY might make its way up to its previous highs near 98.50. 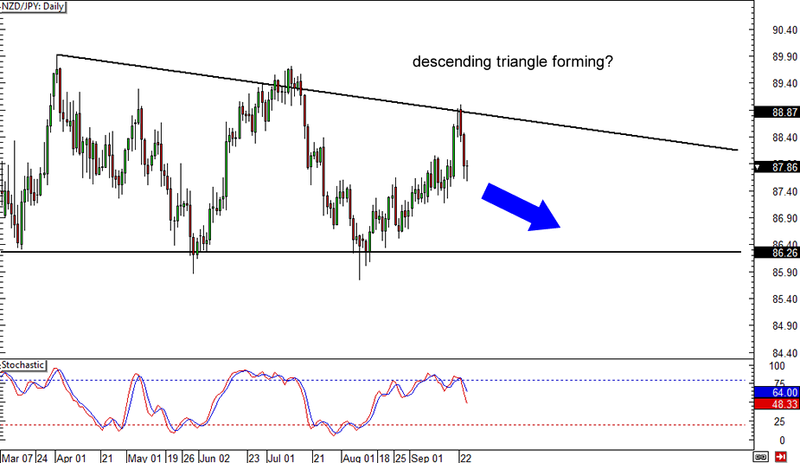 Check out this descending triangle forex pattern that seems to be forming on NZD/JPY’s daily chart! Price has been finding support at the 86.00 levels and has been making lower highs since March this year. It just came off a test of resistance and may be headed back down, possibly until the bottom of the triangle once more. After all, stochastic has been in the overbought zone for quite some time and is starting to move south. It’s not too late to catch the downward momentum but make sure you set a wide stop above the top of the triangle if you’re thinking of shorting!